Our instructors all possess a unique story on how this practice has impacted their life. Each has their own reason for walking through the doors at The Hot Room and sharing the gift they’ve been so graciously granted, but they have one goal for their students: for them to experience the same transformation from this practice that they have. 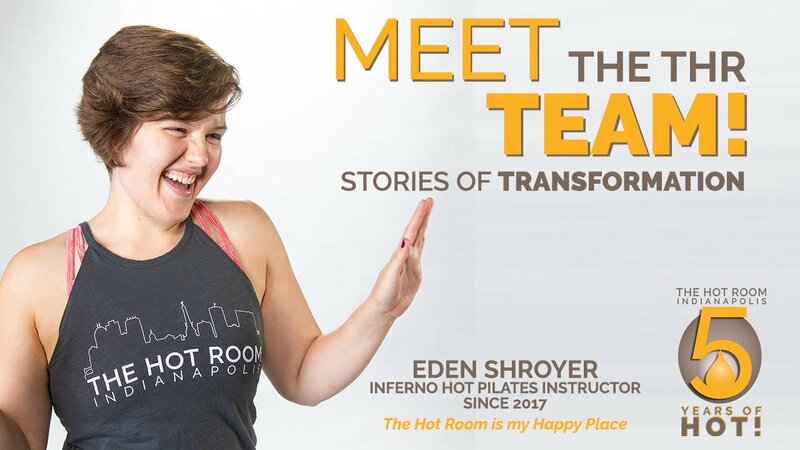 The Hot Room staff spotlight this week is Eden Shroyer. I joined The Hot Room in May of 2016. I found the studio through a Yelp event that took place at the downtown studio. The event was an inferno Hot Pilates class taught by Hye Jin, and I was immediately hooked! I thought Inferno Hot Pilates meant I was going to look “hot” after I took class. I was wrong. I literally had no idea the room would be heated and sweat beads would be rolling down my chest before class started. After a sweaty and energizing class, I bought my intro month that night and haven’t looked back since. The Hot Room has had a huge impact on my transformation. The studio obviously gave me a place to work out and keep my body moving on a consistent basis, but it quickly became more than just another gym or studio. The Hot Room became my happy place, and I wanted to be there as often as possible. I definitely lost a lot of weight once I began going to the studio on a regular basis. People I saw occasionally in the studio would tell me they could see a big difference. This was a huge motivator for me. The staff was noticing me and making me feel amazing about myself! I also began to see myself differently. The thoughts that ran through my head when I looked at myself in the mirror or noticed how my jeans fit were no longer negative. I learned to look at myself in a more positive way and felt happier almost all of the time. Along with exercising more, I have experienced an overall positive change in my mood. Practicing at The Hot Room truly affects how I feel. I have struggled with depression many times in my life, so finding a place that is guaranteed to make me feel happier motivates me to keep coming back. I actually like looking at myself in mirrors now! Being forced to look myself in the eye from the front row of almost every original hot yoga class I have ever taken has really made me notice how beautiful I am. I learned to see myself differently because I had to look at myself during classes. This was very hard for me at first and I had to learn to put a little smile on my face rather than take every yoga class so seriously! Now you can catch me in the mirror not taking myself so seriously. I promise at some point during the balancing series of every original hot yoga class, I will fall out of a pose and you will see me silently laugh at myself. The Hot Room is the first studio that ever felt like home to me, it is a place where I feel very calm (I’m normally very anxious), so I come as often as I can. More importantly, I’ve learned so many things about myself I never realized or allowed myself to notice. I face the good and the ugly, but I learned to be comfortable and confident with both.